As I detailed all the way back in October, a civil service senior management union has taken a stronger stance over key issues in HM Revenue & Customs than the 'left wing' union PCS. This in spite of the management union's apparent conservatism and its own leadership's attempts to convince members to accept the attacks. Tomorrow, this is culminating in strike action - where PCS members will be expected to cross the picket lines of their own senior management on an issue they are technically also in dispute over. Because the UK has the strictest trade union legislation in Europe, this situation was inevitable as soon as PCS retreated from their own campaign and refused to call coordinated action on the same day. Thus, the bulletin that they issued on the subject today, whilst giving a lot of hot air about showing solidarity during tea breaks and more campaigning coming up in the future, essentially boiled down to one thing: an instruction to scab. Officially, and lawfully, they could do nothing else. However, this is of course contrary to the basic principle that you do not cross picket lines. It is also one of the reasons that strikes can be so easily undermined and weakened, and is something that needs to be pushed against. For an individual, the simple act of soothing your own conscience is easy enough. Take leave, call in sick, use flexi time or time off in lieu. If none of these is an option, resign temporarily from your union and take advantage of the fact that workers not in a union are covered by the same protections as those in the union which has balloted under the Trade Union and Labour Relations (Consolidation) Act 19921. However, while it is good that individuals refuse to break strikes or cross picket lines, this in itself isn't enough. It is essentially an individualistic act and doesn't answer the question: how do we collectively challenge the practice of union scabbing and push against the restrictions of our anti-strike laws? I don't want to fully answer the question here, because there is no one right answer or one cast iron blueprint. However, I would argue that there are some basic principles which can be used in looking at this question. The most obvious is that the answer to this lies in rank-and-file organising. The trade union bureaucracies will not challenge the anti-strike laws through organising and direct action, quite simply, because it is not in their interest to. These laws are often referred to as 'anti-union' but in fact they solidify the representative function of a trade union as the mediator between labour and capital, and give power to the bureaucracy over the rank-and-file by restricting 'unofficial' activity and extending legal protections to 'official' activity. There isn't a single set form for this. The possibilities range from the example of the Sparks, who were able to hold numerous visibly militant wildcat strikes and other direct actions in order to win their struggle, to the Pop Up Union, which bypassed the problem of having competing unions in a workplace whilst still remaining bound within the law. The short answer here is whatever you're able to do and whatever works. The second principle I would argue for in this is direct democracy and collective decision making. As I've already said, while an individual action can help soothe a militant's conscience, it does nothing to help organising efforts. To do that, we have to try and involve as many workers as possible. 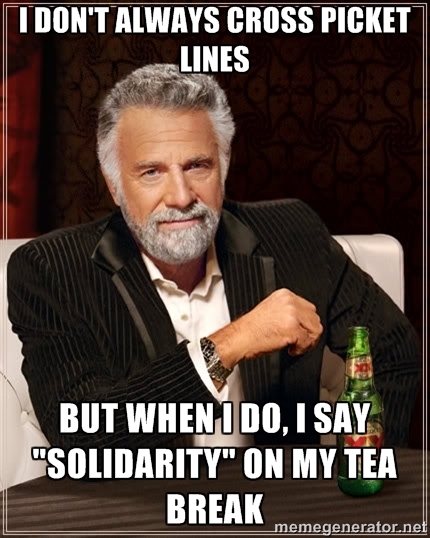 Not only because there is strength in numbers and because solidarity (real solidarity, not tea break solidarity) really is the most powerful weapon we have. But also because the problem we have is that people feel powerless and scared to take this kind of action, and being part of the decision making is far more empowering than a message simply being fed down from above. Finally, it also needs to be stated - as obvious as it may seem - that it will take a lot of slow and painstaking work to get anywhere close to the point where workers in different unions refusing to cross each others' picket lines becomes commonplace. Despite a short notice effort from the Civil Service Rank & File Network, it is likely that most PCS members in HMRC will simply attend work as normal tomorrow. There are a number of reasons for this, but they will include in many cases a fear of disciplinary action, a lack of class consciousness, or both. It will take time to challenge that fear and to raise that consciousness, and many who cross tomorrow can be persuaded not to if the situation arises again, not least the vast majority who will never cross a picket line if it is one put on by their own union. These people cannot be condemned outright, when it is their union rather than their own choices which has put them in this situation, but need to be worked on so that they are convinced the next time around. I would be interested to hear anybody else's thoughts (or even practical experience) on this matter, to start up a conversation and a debate that is long overdue. Because however we do it, we need to start chipping away at the most restrictive union laws in Europe - and it is only direct action which will get those goods. I can't relate to the situation you are describing, but there are 3 recent instances, one of them ongoing, of unions scabbing across my unions picket lines. Last year, the very same SCAB Laborers union, this time in Seattle, crossed ILWU picket lines. During a large tunnel boring project, dirt was being loaded onto barges. This was longshore work so longshoremen in Seattle set up picket lines to demand jurisdiction over the loading of barges. The same union crossed our picket lines and performed the work. Eventually it became such a big stink and so much pressure was put on the drilling company that they had to start trucking the dirt out and eliminated the jobs all together. Now, the master grain handling contract for the Washington / Oregon region expired last February. This contract binds all of the regional grain facilities and ILWU Locals to the same contract in regards to grain handling work in the Pacific Northwest. The bargaining went poorly and Portland, OR & Vancouver, WA were both locked out of their grain facilities. The company said, last year at EGT you gave your workers a concessionary contract, so we want the same contract for you guys or we are walking out. As I write this, the lock out has been going on for an entire year now. The other grain facilities in the region were able to negotiate individual agreements with the facilities and continue working but these 2 ports are still locked out. There have been huge efforts to organize solidarity between unions. The rail road brotherhood has honored our picket and will only pull trains up to the outside of the facilities and exit the train. Managers from the plant have to come out and take the train into their facility. We have gotten the Inland Boatmen's Union & the Masters, Mates and Pilots union to refuse to handle barges and bring grain ships up to the pier. Pretty effective solidarity. We have also been following the railroad out to the grain producing midwest and talking with the farmers and unions out there. Yet MIRACULOUSLY the cowardly International Brotherhood of Electrical Workers (IBEW) continues to scab across our picket lines and perform electrical work daily in the locked out grain facilities. If they had refused to work the facility? We would have had all the pressure in the world because electrical work is vital to the running of these very technical facilities. The company has hired a "strike management" firm called Gettier to provide ex-military security, strike breaking and surveillance during the lock out. Scabs have been running the facility for a year now and the IBEW willingly allow themselves to be driven into a facility and work side by side with scabs. So, in conclusion, in the U.S. we repeatedly get brainwashed with the rhetoric of the Middle Class. People see their class roles solely as an economic bracket that they fit into. I think rank & file workers at the base, whether organized or not need to push to build working class identities. Identities that supersede the roles we play in our daily lives. We need to build a culture of solidarity in our communities and our work places. The thought of crossing a picket line should be so abhorrent that we would never even consider it. When we drive down the street and see a picket? We should cancel our plans and go walk the line and treat every picket as our own. We should be out in our communities getting involved in schools, charities, organizations and we should be wearing our union colors when we do it. We should engage workers about what it means to be working class. Teach people about the alienation and exploitation we all face in our daily lives. We can't limit our action to industrial disputes, it has to cross all boundaries. This isn't an immediate fix to unions crossing picket lines, but if we educate one another and build a culture and identity around being workers and the collective power that we have, we can stave off these kinds of things in the future. Going to work shouldn't end at a paycheck, it should be a conscious assertion of our class.